Joanne has owned Italian Greyhounds for 25 years. Her first IG was called Gladys and was rescued by her breeder from a home where circumstances meant that she was not getting the care that she should. She was just a year old. Gladys started Jo’s love affair with this magical breed. She currently has 12 Italian Greyhounds from age range 2 up to nearly 16 years, plus a Dachshund and a Spanish Galgo Rescue. Jo has foster cared and home checked for IGRC in the past and is fortunate in having her own paddocks for exercising dogs which makes it a pleasure for Jo and our foster IGs, many of whom have never had the joy of free running. 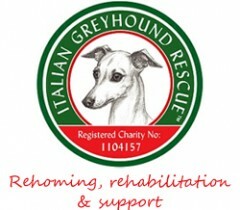 Being placed in the Midlands is also ideal when it comes to home checking and helping transport our Rescues where needed.